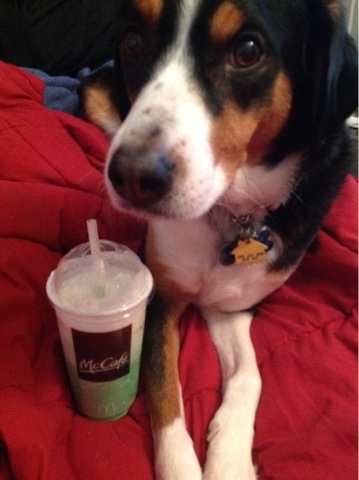 Cassandra: Shamrock shakes are back! Yum! Shamrock shakes are back! Yum! So excited for these. I don't care a lick about Girl Scout cookies, but shamrock shakes? I'm so there! Poor Mollie. It's like negative eighty billion outside and she was like, "Why are you taking pictures? Let's get under the warm blankets!" 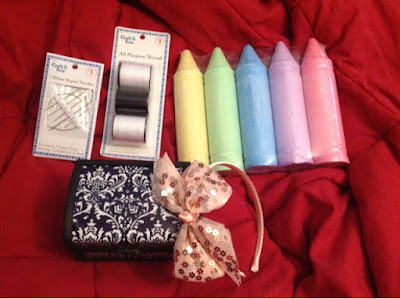 I also picked up new embroidery needles ($1), thread ($1), chalk for my chalk wall [giant crayon shaped! Too adorable!] ($3), a damask box ($2), and the cutest headband ($2)! Mollie even behaved very well being left in the car with my brother as I ran into Family Dollar. She got a baby cone as a reward.